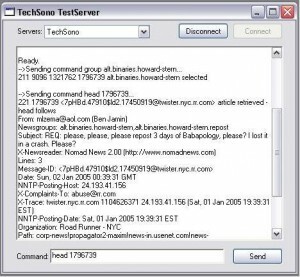 To test a Usenet server with NewzToolz, click the Newsgroups tab on the main window and then click the Test News Server button. Purpose: This window is for testing the connection to your Usenet server when you are having connection problems. It can also be used to send commands to the server. 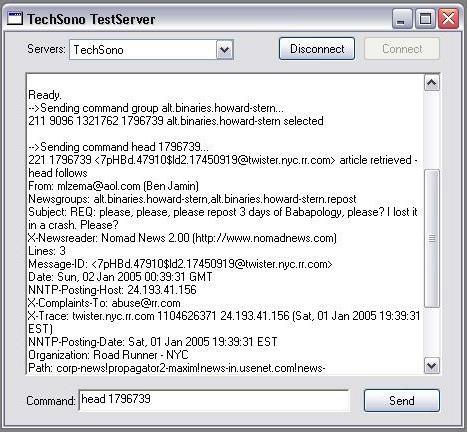 Usenet server software often does not give you good information when it encounters a problem. If you log onto your server here, you will see all of the messages it sends, and this can often provide vital clues as to what the problem is. If you make changes to your Usenet server(s) on the Setup Servers window the changes will not be reflected here until you close, and re-open the window. Instructions – Make sure the correct server is selected in the pop-up menu at the top of the window, and then click the Connect button. You don’t need to understand everything the server sends back. If you can send the Help command, and get back a list of all the commands the server supports, then you have successfully connected. If you cannot, then you can copy-and-paste the text and send it to your ISP, or read it to them over the phone. The lines that begin with “–>” indicate what NewzToolz is sending to the server.